On October 30, 2015, Caltrans was notified by the media that the Coyote Valley Band of Pomo Indians and the Round Valley Indian Tribes sent out a press release outlining tribal complaints regarding the Willits Bypass project and announcing their intention to file suit against the Department. The Tribes allege that Caltrans knowingly destroyed historic cultural sites in violation of the National Environmental Policy Act and the National Historic Preservation Act. These statements are factually inaccurate, and are damaging not only to this project – which will link Californians north of Willits to the rest of the state with a safe, reliable, and efficient route through Mendocino County – but also to the taxpayers of California, who will ultimately end up footing the bill for this unnecessary legal action. Caltrans not only employs its own archaeological staff, but also works with tribal cultural monitors at construction sites in culturally sensitive areas. These monitors are liaisons between the construction and their tribal leadership, and are there to directly represent their tribe. Another statement suggests that “Caltrans has yet to implement a process for identifying historic properties, cultural resources, and archaeological sites.” Caltrans has been following Section 106 of the National Historic Preservation Act while negotiating an intergovernmental agreement with area tribes, otherwise known as a “programmatic agreement,” which proposes guidelines and practices for the preservation of cultural, historical, sacred, and archaeological discoveries in the construction area. The Coyote Valley Band of Pomo Indians has not negotiated terms of this agreement in good faith during the several meetings between the Tribe and Caltrans. The Round Valley Indian Tribes have never commented on the proposed agreement; they attended one meeting and their representative did not voice any concerns regarding the proposed agreement. The lack of a unique agreement for the Willits Bypass is not due to inaction on Caltrans’ part. Michael Hunter, the Chairman of the Coyote Valley Band of Pomo Indians, alleges that Caltrans bulldozers destroyed a sacred cultural site in the Little Lake Valley “in the dead of night” without tribal monitors being notified or present. To date, no cultural sites have been destroyed at the site of the Willits Bypass or its mitigation properties. Other complaints suggest that the identification of cultural sites occurs only after ground-disturbing construction activity is complete, and urges the Court to suspend work at the Willits Bypass in order to address damage to cultural sites. However, ground-disturbing construction activities at the Willits Bypass are virtually (over 95%) complete. Again, archaeological staff, environmental staff, and tribal monitors are on-site to ensure that potential archaeological sites are avoided if possible, or mitigated for. Caltrans has complied with State and Federal laws during the construction of the Willits Bypass. Caltrans is required to define a need and purpose fora project prior to that project being funded by the California Transportation Commission. As part of the project design process, Caltrans identifies several possible alternatives, and – with public input – determines the most appropriate and least-impactful feasible alternative. Caltrans has attempted to open dialogues with the Tribes and has been working with tribal monitors during the course of the project. Caltrans has also worked with the Advisory Council on Historic Preservation and the California Office of Historic Preservation to address impacts to historic properties. The Programmatic Agreement, Section III-A addresses the measures Caltrans will perform. See text below. (e) Appropriately permit and consider public input. Again – public input is solicited early on in the project, years before environmental studies are undertaken or construction is ever slated to begin. 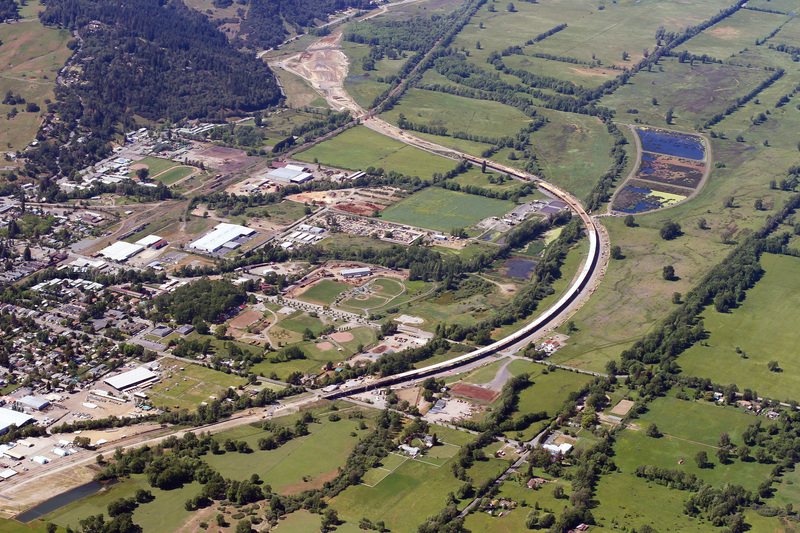 Caltrans has adhered to State and Federal guidelines and environmental law over the course of the Willits Bypass Project. The Department denies the allegations that it has acted in bad faith, and regrets that the Tribes feel this situation must be handled in Court and in the media. A. Ethnographic and Archaeological Synthesis Report Caltrans shall ensure production of an Ethnographic and Archaeological Synthesis (Synthesis) in order to expand the understanding and interpretation of prehistoric and historic use of Little Lake Valley. The Synthesis will include new oral history interviews and review of previous ethnographic studies as well as analysis of artifact assemblages, landscape evolution, cultural chronology, subsistence, and land use. It will incorporate data and findings from work performed under Stipulation II.A and II.C as well as previous regional work. Within 30 days of execution of the PA, Caltrans shall invite the Tribes to a kick-off meeting held in Mendocino County to discuss the scope of the synthesis. Caltrans will continue consultation with the Tribes for not more than 12 months after execution of this PA to determine the scope and content of this document as well as methods for information collection that respect issues of confidentiality and intellectual property. The synthesis shall be finalized in accordance with Stipulation V.C within four years of the execution of this PA.
a) draft narrative content, and b) draft of proposed panels with layout, artwork, and content. At each of these steps, Caltrans shall afford the Tribes 60 days to provide comments to Caltrans who will take the comments into consideration while finalizing the panels. The interpretive exhibit shall be installed within six years of execution of this PA.
2. Caltrans shall provide cultural resources technical expertise to assist the SVBP, RVIT, and CVBP in training Tribal Monitors.Caltrans shall arrange for two tours for up to five SVBP tribal members, up to five RVIT tribal members, and up to five CVBP tribal members each tour to visit an archaeological laboratory for hands-on experience with artifact handling, cataloging and special studies, including providing transportation, lodging, and per diem at state rates. Said lab visit shall be at least three full days, not including travel days. Caltrans shall arrange for two such visits and shall be completed within two years from execution of this PA.
3. Caltrans shall arrange for up to three, three-hour “hands-on” training sessions at a Tribally-sponsored Pomo Cultural and/or Environmental Camp. The three sessions shall include interactive opportunities for tribal youth to better understand how archaeologists approach material culture studies. The three training sessions shall be completed within two years from execution of this PA.
4. Caltrans shall provide an empty “shell” of the Caltrans Cultural Resources Database (CCRD) and provide introductory training on ARC GIS and the use of the CCRD for up to five – SVBP appointed personnel. Said training shall consist of one, three-day training session at SVBP’s tribal office on SVBP’s equipment to occur within one year from the execution of this PA.
5. Caltrans will collaborate with the Mendocino County Museum to create an interactive and educational exhibit that interprets the Synthesis findings on the past occupation of and the ongoing connections to the Little Lake Valley by Native peoples. Caltrans will invite the Tribes to participate in all aspects of exhibit design, creation, and implementation, including the development of all related educational materials, brochures publications, and marketing materials. Caltrans will provide funding to the museum for designing, creating installing and presenting the exhibit. Caltrans will also fund the cost of an exhibit brochure, educational materials, and/or other related publications in conjunction with the exhibit, in a manner and to the extent agreed upon by Caltrans, the Tribes, and the museum. The exhibit may include indoor and outdoor elements. The museum exhibit shall be installed within six years of execution of this PA. This entry was tagged caltrans, mitigation, section 106, willits bypass. Bookmark the permalink.